This streamlined classic Frameless Pivot Door is suitable for use in a recess or combined with a side panel to form an enclosure. 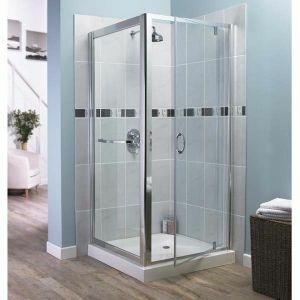 Fits beautifully within a modern or classic bathroom. Shower tray and side panel are supplied separately. Frosted glass pattern is available in silver frame. Please contact us for more details. We supply the full range of products by Aqualux. If you do not see what you are looking for, please contact us.